The partial wedge shot is one that even PGA pros try to avoid if they can. They either go for the green or lay up 100+ yards away from the green. But learning how to hit a wedge shot 50 to 75 yards consistently can get you out of a lot of trouble and have a significant effect on your score. Why Is A Partial Wedge Shot More Difficult? A partial wedge shot is more difficult because it (typically) requires a less than full swing. To hit a partial shot, you need to find some way to cut distance off of your shortest club. For many golfers, this is a lob wedge or a sand wedge. That means you cannot just take the club out and make a swing like you would for any other shot. It requires some degree of feel and finesse and when you try making little adjustments like that…things tend to go wrong. Your timing is different, your feel is off, you can’t be sure you have the right amount of effort for that specific yardage, and you just generally don’t feel comfortable over this kind of shot. One of the most useful pieces of advice I ever heard for these types of shots is to take the feel out of the shot. More accurately, you want to avoid changing the feel from your normal swing. So in order to keep the same feel, you want to do other things to take yardage off of your full shot. The important part to remember is that whatever you do to take yardage off your full shot, it should be (1) repeatable and (2) measurable. Those two things will help you be comfortable knowing that if you make specific measurable adjustments, you can count of hitting a specific yardage most of the time. Then you can feel more confident with those tricky in-between yardages. If you are looking for a new wedge, check out the review of my favorite wedges here. If you have read any of my other posts on this blog, you know that I’m not a pro. I’m just a guy trying to break par. So I’m going to try and avoid any technical swing instruction here and instead focus on more general strategies that have worked for me to make these type of shots a little less tricky. This is as simple as it gets and can be very effective. 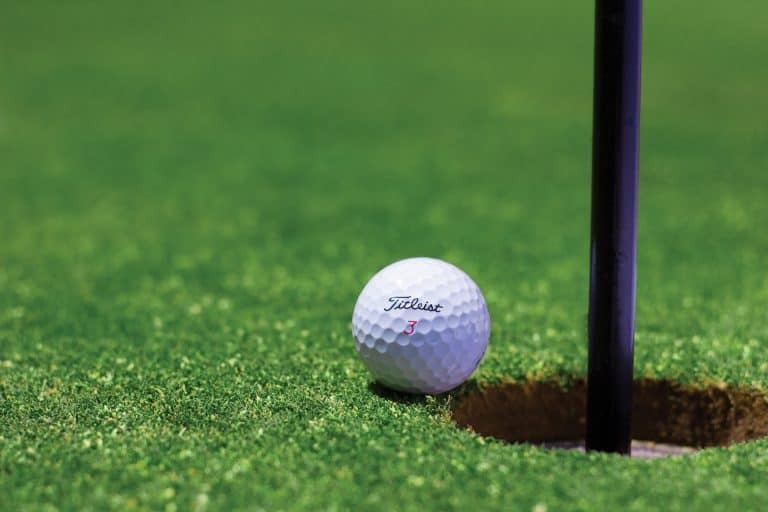 As you move your grip on the club lower, you are making the shaft shorter and effectively lowering the speed of the clubhead even if your hand speed remains constant. This will reduce the distance of your shot. How much it reduces the distance is for you to figure out because everyone will be different. I know that I can knock about 8 yards off of a wedge shot for every inch I grip down on the club. I usually don’t go lower than 2 inches though because it starts to change the swing dramatically at that point. 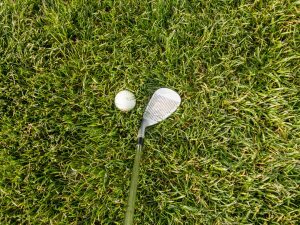 One thing to be aware of when implementing this,however, is that gripping down and shortening the club’s length will result in a more upright lie angle. Especially with wedges, this can result in a shot that tends to fade (moves right for a right hander). You can read more about the effect of changing lie angle here. For these purposes though, as long as you practice this a little, you should be able to compensate for the fade. This strategy of controlling distance on partial wedge shots was popularized by Dave Pelz in his Short Game Bible. I can’t say I subscribe to everything Pelz suggests, but he does do a great job of developing a system to help you manage these partial distances. Having a go to system that can take the guesswork out of partial wedge shots is a huge step towards becoming more consistent. The clock method just simply means practicing swings where the backswing stops at certain spots, using the numbers on a clock as a guide. For example, your full swing may mean your hands swing back to 2 o’clock or even 1 o’clock. So if you can become comfortable swinging back to 3 o’clock when the need arises, then you have effectively developed a repeatable swing that will result in a shorter shot with the same club. The pros of this method is that it doesn’t require any setup adjustment or aim compensation like some of the other strategies. However, it does require you to use some amount of dynamic feel during the swing which is prone to error when you’re under a little on course pressure. The best way to overcome this is with more practice to the point of being comfortable enough to execute 3, 4, 5 o’clock swings without much thought. Opening up the clubface can take off yardage and help stop the ball quickly. This approach requires a little more skill but can give you a lot more control over how the ball lands if executed properly. The basic concept is that by opening the face you are adding loft to the club and decreasing the distance. You can simply make this adjustment with your grip and swing the same speed and the ball will fly higher and shorter. Of course when you open the clubface, the ball will tend to fade so you need to aim the opposite direction to compensate. This is the part that requires practice to understand how much the ball will fade and how far in the other direction you need to compensate. This approach is best used with small adjustments if you are just trying to knock a few yards off of your shot. More than that and you are hitting a flop shot and probably need some drastic swing and setup adjustments. Overall, I do like using an open clubface in specific circumstances such as when there is less green to work with. But I don’t think it is reliable enough for the average golfer to execute in a clutch situation. This is more of a specialty shot that can be used only in certain circumstances. When you have relatively flat fairway in front of you and a green with no hazards in front of it, using a less lofted iron and running it along the ground can be quite useful. It can be difficult to hit it extremely close to the pin but this type of shot tends to eliminate the big misses. That can be great for a higher handicap golfer or for anyone when you have a solid round going and you want to avoid the big number. There are a few reasons the chip (or bump) and run shot minimizes risk. First, you don’t have to swing as fast to get the ball to the hole. A shorter swing means less chance for a miss hit (usually). Second, even if you don’t hit the sweet spot it tends to be self correcting. Hit it a little high on the face and you’ll get less forward momentum but also less spin so it can roll out to the hole. Hit it a little low on the face and it will come out a little low and fast moving, but with more spin that will stop it sooner (unless you completely skull it, then I can’t really help you). This is a perfect example of a green that works for a chip and run. You do have to factor in the ground conditions a little more for this shot. For example you need to assess whether the ground is wet, how closely mowed the fairway is, and whether there are any slopes to contend with. But even with these considerations, it can be a great way to minimize errors on the tricky partial wedge shot and keep a good round going. This isn’t a single method, but instead applies to any method you use to hit partial shots, whether it’s one of the ones above or not. Whichever method you use, it is invaluable to keep your own statistics on your shots. This means statistics on the distances each method produces and the success rate of each method. First, you need to figure out your distances. This is important in every shot in the game but becomes even more important with shorter shots because as you get closer to the green, you want to be more precise with your landing spots. Let’s take the choking down on the club method as an example. When you are at the range (or better yet a practice round on an empty course with no one behind you), write down how far you hit each shot when you choke down 1 inch. Then take the average of all of those shots. Then hit a few more shots choking down 2 inches and do the same thing. Now you have an average distance for choking down 1 inch and 2 inches. Next time you are out on the course, you can either consult your notes (or remember it). Then you can swing confidently knowing that most of the time, that method will give you the result you want. Then you should track the success rate of whatever methods you are comfortable with. This is something you want to do on the course during a normal round. Let’s say you like using the clock method and the open clubface method. 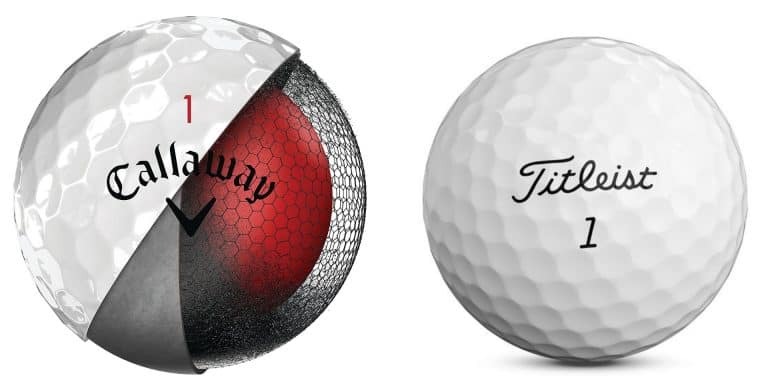 Try to use them both during a round in which you are keeping score. 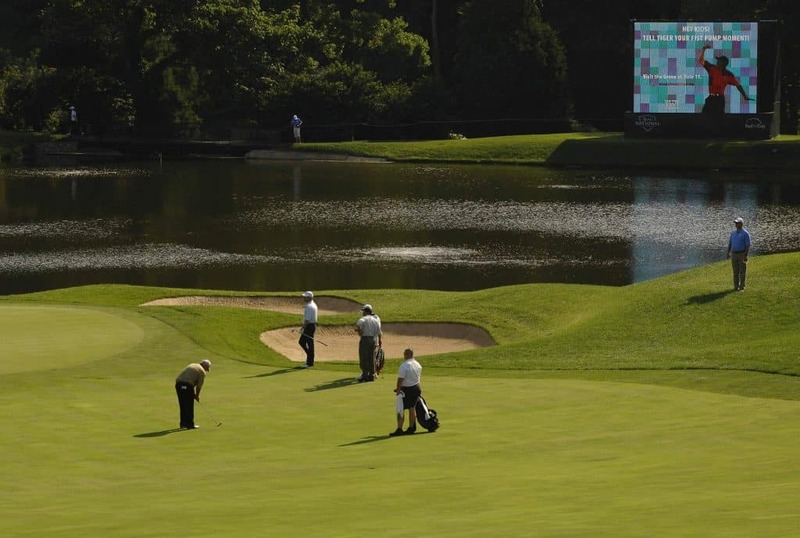 Determine what would be a success for you (on the green, within 20 feet, etc.) and keep track of how often that method of partial shotmaking is successful. Over time you will probably see a clear winner emerge. Now you have your go to method. Attack those partial wedge shots with confidence. If you are looking for a great app to track your statistics, check out The Grint. Weird name but it has the best functionality of all the apps I’ve tried. They have a free version you should get started with but the (relatively inexpensive) paid service is worth it for all the features it gives you. A simple thing like tracking your stats and knowing what to work on can make more of a difference in your game than expensive lessons.